Being disabled and playing video games can be an enormous pain. My hearing is weak in my left ear; I have fine motor control issues that can make controlling some games difficult. I have neurological issues that vary from day to day, but sometimes leave my vision blurred and my face a little slack, which hinders my ability to communicate. I still hold a grudge against the original Assassin’s Creed for not having subtitles and I crank the volume as loud as it can go when I play Overwatch so I can hear all the contextual dialog. Playing Red Dead Redemption 2requires me to position the monitor as close to my face as possible. I was pleasantly surprised when I loaded up Apex Legends and started poking around the audio section of its menus. The options are much more varied than what I’ve seen, or heard, in most other modern games. First, there are the much-praised ping options for communicating with your team. 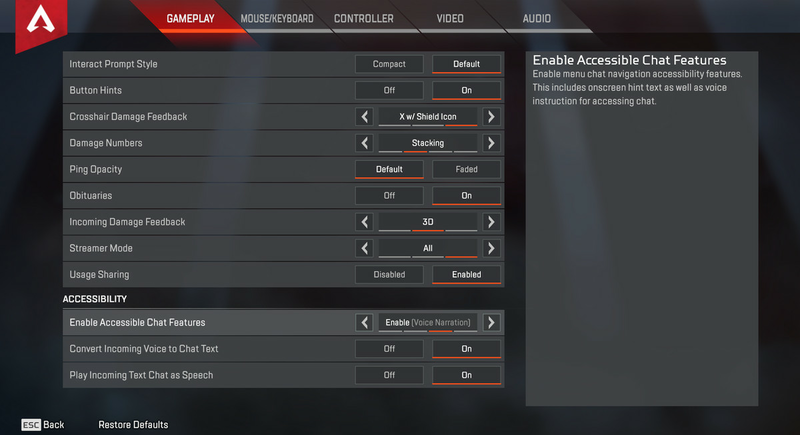 This is fantastic for those who may be socially averse and want to play Apex Legends without speaking to others … but it’s even better for days that I’m slurring my speech or need to focus my attention on playing and not speaking. Voice chat can also encourage harassment, which means that many other players will be thankful for ways to communicate that don’t require the use of their voice. The ping system already goes above and beyond the forms of accommodation I’ve found in any other game in how much information can be shared with others and how easy it is to use. But the rest of the game’s options are just as exciting for those of us who may struggle with our hearing, speech or sight. The game allows you to enable accessible chat features, convert incoming voice to chat text, and also to play incoming text chat as speech. Accessible chat converts in-game information into voice narration or text that is accessible at all times, providing text or spoken prompts for common keyboard shortcuts as you learn the game. There’s also an option to do the opposite, which turns the words that players say through voice chat into written text if it’s easier for you to read text rather than hear what’s going on. Accessibility often feels like a bit of an afterthought for many developers, but these options solve complicated problems in a way that could help a large percentage of players. Respawn put the intro into creating an accessible experience for players with disabilities, and that effort makes me admire the studio, and enjoy the game, even more. It genuinely feels amazing and welcoming to see this little box of menu options that was put in to make the game playable for so many players who struggle to see, hear, or understand the information coming in from other games. Bravo.